SOLARAY ~ BIG BOSS HEADPHONES. INLINE REMOTE AND MIC INCLUDED. BIG SOUND FOR THE BIG BOSS! COLOR : MAROON RED. Portable Audio. Ear-Cup (Over the Ear). Earpiece Design. Bose SIE2i sport headphones, customized for select Apple devices, are specifically engineered for exercise. 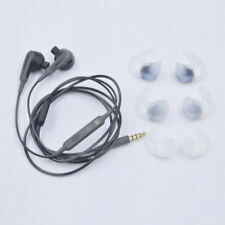 SIE2i sport headphones. Tonally balanced audio with crisp highs and deep lows. Note: If sales season, bad weather.may be delayed. Open box, untested, appear unused. infared operated. A soft silicone material and unique shape provide a secure fit that stays put and feels good. Wireless convenience, with easy Bluetooth and NFC pairing aided by voice prompts. 1x bluetooth headphone. New in the box BIG BOSS headphones from Solaray. You also get an incline remote and mic for taking your important big boss calls. Rich look and feel, these headphones boast rich sound and looks reserved for the truly discerning audiophile. Boss HP12 Infrared Foldable Cordless Headphone - Stereo - Wireless - Infrared - 30 Hz 20 kHz - 60 dB SNR - Over-the-head - Binaural - Ear-cup. Manufacturer Part Number HP12. Product Model HP12. Product Title BOSS AUDIO HP12 For use with any 12V Video Monitor with IR Transmission. Boss Audio Systems HP12 Wireless Headphones. Features: Foldable. Earpiece Design: Over-the-head. Earpiece Type: Binaural. Wireless Technology: Infrared. Connectivity Technology: Wireless. Sound Mode: Stereo. Solaray Big Boss Headphones with In-line Remote & Mic - Metallic GREEN. Condition is New. Shipped with USPS First Class Package. BOSS 2-channel Ir Wireless Headphones HP34C - Sold as 1 Each. The 2-Channel IR Wireless Headphones from Boss Audio System are infrared and foldable. Stand out while staying tuned into your favorite music. 4,Inline mic allows you to take calls with ease. As picture show without original box. 1,Enjoy music and calls with high quality audio on your iPod/iPhone. Great for workouts and regular daily usage. Sound quality is great! Retail price with tax: $320 approximately. Condition: Like new! Shipment: 1-3 days priority shipment. Promised next day shipment. Selling within the US. Please feel free to message me regarding any questions or concerns. Open to accept offers that are reasonable. SoundSport Bluetooth NFC Wireless Neckband Wireless Headphones - Black. A soft silicone material and unique shape provide a secure fit that stays put and feels good. Connectivity Technology: Wireless. Boss HP34C Wireless Headphones. Dual Channel. Original Bose in ear headphones earphones 1st Generation Old Version. One genuine Bose In-Ear Headphones Earphones 1st Generation. 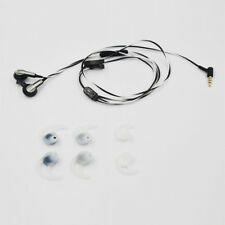 This earphone can be workable for with all 3.5mm jacks devices, such as iphone ipad and other Mp3 etc. One genuine Bose In-Ear Headphones Earphones 1st Generation. Note: If sales season, bad weather.may be delayed. As picture show without original box. Features and Technical Specifications. Soundsport headphones. Proprietary StayHear?. Note: If sales season, bad weather.may be delayed. Your music in deep, clear sound. Inline mic and remote for calls and music on select Apple devices. Sweat- and weather-resistant; engineered and tested for lasting quality and durability. Headphones, frequency response 20-20.000Hz, impedance 30 Ohm. Microphone, frequency response 75-16.000 Hz, impedance 2.2 K.
SOLARAY ~ BIG BOSS HEADPHONES. INLINE REMOTE AND MIC INCLUDED. BIG SOUND FOR THE BIG BOSS! BIG BOSS HEADPHONE SET. CABLE : 1.2M. COLOR : BLUE. Pre Owner Boss Headphone With Charging Cord Included. This preowned boss head phone was barely used. It does not have scratches on it and still retains it’s original white color. Can be used for Big Boss calls!